Paradise awaits you at the Four Seasons Resort Punta Mita, Mexico! Worldwide, the Four Seasons experience embodies the supreme standard of excellence in travel hospitality. The Four Seasons Residence Club Punta Mita Mexico is no exception. Surrounded by pristine white sand and breathtaking views, you will discover true paradise during your stay on this private isthmus. The crystal blue waters of the Pacific Ocean will speak to your soul, and the lush seaside landscape will serenade your senses. Your over-sized Four Seasons Residence Club villa is conveniently located inside gates of Punta Mita on the Four Seasons Resort property. This apt location allows convenient access to the resort, yet still lets you savor exclusive privacy. You will have access to Four Seasons' full services and amenities including concierge services, daily maid service, room service, restaurants, golf, babysitting services, Kids Club, gym, spa and resort activities. 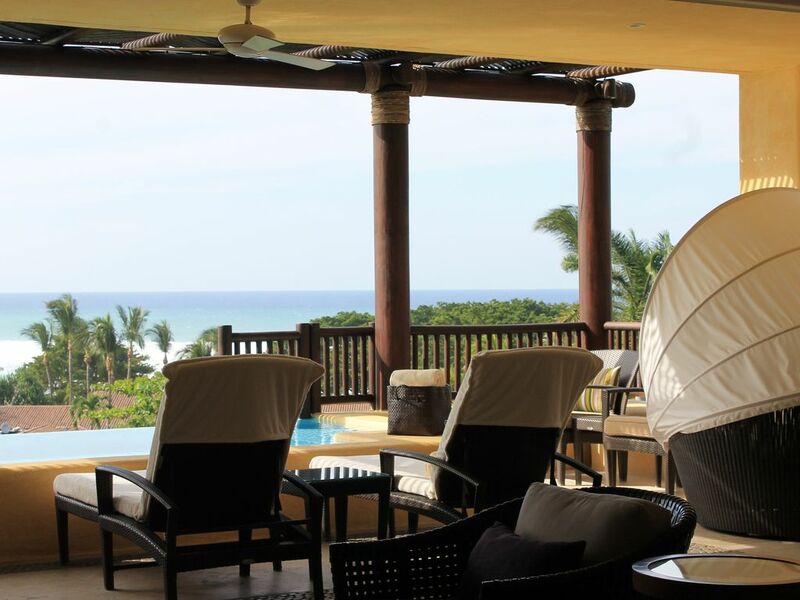 Upon arrival, to your ocean view villa, you will be welcomed by an open air living space laden with an ambiance of Mexican art and architecture. The entryway and baths are lined with stone flooring features detailing Travertine tiles with stone mosaics and pebble detailing. Your private terrace showcases an infinity pool that appears to kiss the ocean. You can sun yourself by the ocean or in one of four pool areas including the family pool, the adult-only pool complex, the children's pool or the lazy river. Absorb majestic, calming views of the sea from the sanctuary of your room or rejuvenate your body at the full-service spa and wellness center. Savor culinary excellence in one of many restaurants or dine on your private terrace at sunset. Anticipate your expectations to be surpassed if you crave a spectrum of recreational activities. Play a round of golf at Conde Nast Traveler’s #1 world-rated golf resort. This Jack Nicklaus-designed course spans the Pacific shore. Challenge yourself on the optional 19th hole boasting the "Tail of the Whale" island green. If tennis is your game, participate in a private or group clinic to sharpen your skills. Soak in the sun at one of two exclusive beaches. Activities include sail boating, kayaks, snorkeling, fishing, volleyball, paddle ball, Frisbee and more. The little ones will love the Kids for All Seasons program. *Alternate dates might be available. Please inquire for more information (Holidays are not available unless reflected on the availability calendar). **Note that pictures are representative of a two and four bedroom. Your unit will be in one of several different buildings, so the exact furnishings may not be as pictured, but are all with Four Seasons "simple, sumptuous décor." • 3 Bedroom unit is 287 square meters (3,090 square feet) to 311 square meters (3,347 square feet) of indoor/outdoor living space. Inquire for other unit sizes. You’ll never tire of the spectacular ocean-view from your airy, living room, which opens onto the roomy terrace with sliding glass walls that disappear to the side for a seamless indoor and outdoor living experience. In the Four Seasons tradition of excellence, your kitchen features state-of-the-art appliances including a Sub Zero refrigerator, Wolf gas range and oven, built-in microwave, dishwasher and double stainless sink. Cabinets are constructed of rich tropical wood and countertops are creamy cashmere granite. Opening generously onto your living room, your dining area is constructed of rich tropical woods and provides an equally spectacular ocean-view. Seats eight. Punta Mita’s year-round sunshine invites you to relax on your spacious private terrace that seems at one with your living room. You can watch the sun set over the Pacific from your private plunge pool or chaises lounges. Afterwards, barbeque fresh fish taken from the waters in front of your villa on your built-in stainless steel gas grill. Enjoy an alfresco dinner with comfortable seating for four, while serenaded by the sounds of the gentle Pacific surf. Master bedrooms include famously comfortable Four Seasons king-sized beds and offer ocean-views and private terraces with seating for two. All bedrooms include televisions, two-line phones and large closets. Every detail reflects Four Seasons quality. Countertops are constructed of Mexican-quarried, sealed ivory Travertine while fixtures are contemporary chrome. Carved framed mirrors contrast with frameless glass shower enclosures and separate tubs. One master bath includes an outdoor shower with an outdoor carved stone tub highlighted by floor lights. And, of course, every bathroom is thoughtfully stocked with plush towels, signature Four Seasons bathrobes and premium toiletries. We loved the residence and the resort. The service model of the four seasons is the best. They are so helpful and accommodating. The layout of the 4 br was perfect for our needs and had spectacular views and sunsets. We used our plunge pool everyday. We were there to celebrate a 60th bday and it was the best vacation we have taken to date. The kids loved the arcade and the infinity pool. The breakfast at Ketsi was amazing as were the 2 restaurants. Thank you so much for the experience. We will definitely be back! Everything was perfect- absolutely beautiful villa, impeccable service, great location. We loved every second of our trip! This place is amazing...its big, beautiful, open and airy and the service is fantastic. We are about to come back for a third time! We had an amazing time at the Four Seasons Villa. The way that we were dealt with, from the moment we contacted the owners representative, was fabulous! The property was very clean and well maintained and had all of the mod cons that one could want. Being at the Four Seasons Punta Mita is, in itself an amazing experience but being able to use the Villa made it even more extraordinary. I would highly recommend this Villa! I am so happy that you enjoyed yourselves. How how I can make your next stay with us rated 5/5? Worldwide, the Four Seasons experience embodies a supreme standard of excellence in travel hospitality. The Four Seasons Resort Punta Mita is no exception. Surrounded by pristine white sand and breathtaking views, you will discover true paradise during your stay on this private, gated isthmus. The crystal blue waters of the Pacific Ocean will speak to your soul, and the lush seaside landscape will serenade your senses. Your oversized villa is conveniently located in Four Seasons Resort Punta Mita. This apt location allows convenient access to the resort, yet still allows you to savor exclusive privacy. You will be welcomed with an open air living space laden with an ambiance of Mexican art and architecture. The entryway and baths are lined with stone flooring features detailing Travertine tiles with stone mosaics and pebble detailing. Your private terrace showcases an infinity pool that appears to kiss the ocean. You can sun yourself by the ocean or in one of four pool areas including the family pool, the adult-only pool complex, the children's pool or the lazy river. Absorb majestic, calming views of the sea from the sanctuary of your villa or rejuvenate your body at the full-service spa and wellness center. Savor culinary excellence in one of many restaurants or dine on your private terrace at sunset. Enjoy views of the ocean & elevate your golf game to a whole new level on the two challenging Jack Nicklaus courses. The first Championship Signature course is rated #1 in the world by Conde Nast and features the "Whale Tail" island green. The second is the Bahia Golf Course at St. Regis Punta Mita Resort. If tennis is your game, participate in a private or group clinic to sharpen your skills. Soak in the sun at one of two exclusive beaches. Activities include sail boating, kayaks, snorkeling, fishing, volleyball, paddle ball, Frisbee and more. The little ones will love the Kids for All Seasons program. Explore the canopy of the Sierra Madre Mountains' tropical rainforest in a private eco-reserve. Punta Mita boasts some of the best sea-fishing in the world. Take a charter to find hot spots for marlin, tuna, mahi mahi, dorado and sailfish. Discover an unspoiled tropical diving experience in the Punta Mita underworld as you scuba dive the breathtaking waters. World renowned surfing spots are within a short drive from the condo. Tour the jungle on an escorted horseback ride. Take a “Wild” ATV excursion to explore the jungle and beach. Drive through traditional Mexican towns and visit a genuine tequila factory. Christmas, New Years, Easter & Thanksgiving are holiday rates. Please contact us for more details.